I have sensitive skin, and it doesn’t end at my face, I also have a sensitive scalp. Every-time I go to the hair dressers they peer into it and declare it’s slightly pink and therefore should buy ‘said product’ for sensitive scalps. I don’t ever buy from hairdressers when in the salon chair because they are working their sales targets and I feel like I am getting the hard sell. As a beauty blogger I like to do my own research and share my findings. So back to this sensitive scalp situation. What causes a sensitive scalp; several factors, such as pollution, stress, hormones or even the products you use that are too harsh and full of unnecessary chemicals and silicones. It can also just be genetics; if you suffer from hay fever or eczema you may be prone to scalp sensitivity as well. The key is flexibility and balance; find a routine that works for you! Over the years I have learnt to pay attention to my skin and adapt my routine as needed. Sometimes my scalps needs can change depending on the weather, my stress levels or the foods I eat. It is likely that a set 3 products will not work for you for a lifetime, so be flexible. An interesting product group, which has been gaining momentum in the industry, is the scalp serum. I have been given 2 to test out: Nioxin Intensive treatment and Viviscal Hair & Scalp Serum. Both brands have a background in scalp health and treatment for hair loss. Nioxin Hair Booster Treatment 30ml £22: This product is for areas of thinning hair and is said to boost those areas to create a fuller more dense look. Texture & Application: The bottle confuses me because it’s quite big yet there is a smaller tube inside the bottle that holds the product, which means you get 50% less product than it would have you believe. The pump applicator is okay, but it means it is a little difficult to control how much product you dispense. It comes with a little clip which stops the product from dispensing should you take it on your travels, however, I have lost this clip twice and it is super fiddly. Recommended usage: twice daily. 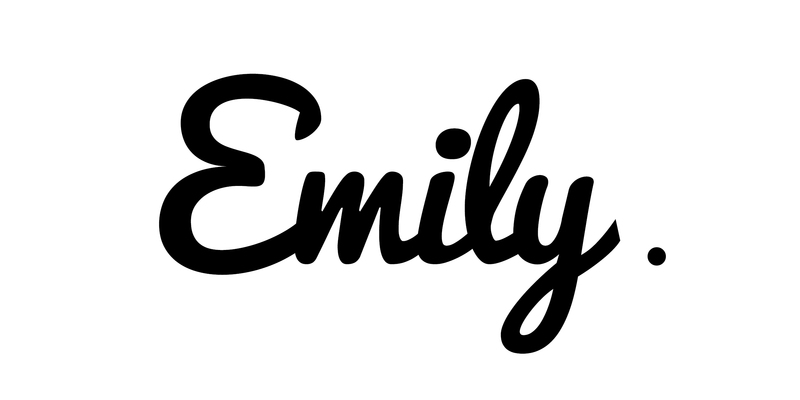 The product has a lovely texture; a super lightweight serum. Don’t baulk at the idea of putting this on dry hair because it absorbs very fast and doesn’t leave residue. The smell is slightly medical with a whiff of menthol. They say you may experience some redness on application but I didn’t get any! Results: I noticed about a 20% increase in volume around the areas I put the serum. I would recommend using on wet hair before you dry. 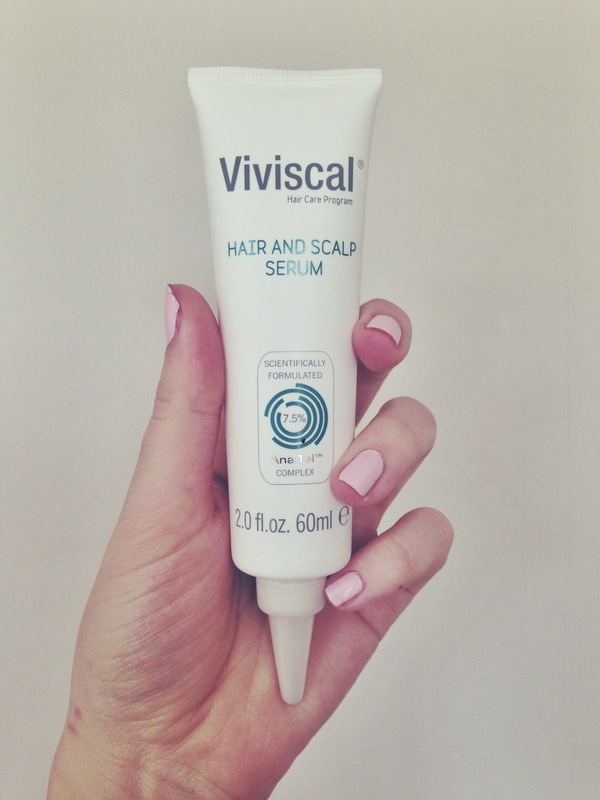 Viviscal Hair & Scalp Serum 60ml £24.99: This serum claims to help support healthy hair growth by improving condition of the scalp whilst boosting hair volume. Viviscal Hair and Scalp Serum is made of 99% naturally derived ingredients including: Menthol & Creatine sourced from pea sprouts and grape seeds. Texture & Application: This serum comes in a white tube with a small nozzle and cap. Aesthetically this product looks better that Nioxin and I liked how easy it was to control the amount of product you use. It holds double what the Nixoin tube does but is about the same size also. Recommended usage: twice daily for 3-6months. 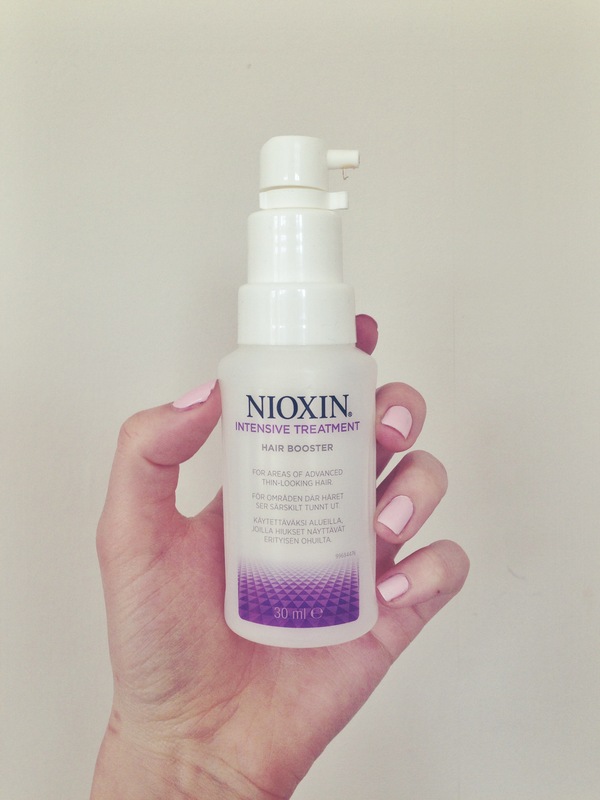 The product, like Nioxin is a super lightweight serum which virtually disappears on contact with the scalp. The smell of menthol is a lot stronger in this product and it has an intense tingle (about 50% more that the Nioxin one). Results: This product is very good at boosting volume at the roots (40% more volume) and I only used 3 pea sized amounts across the whole scalp. It travels a lot further than Nioxin as well and I really enjoyed the tingling sensation on my scalp. It does however cause redness after application, but this faded after 5 minutes. Verdict: I think Viviscal is the superior product, not only does it feel like it’s working more on the scalp but it creates a lot of volume at my roots and felt really lovely as well on my scalp. Would I consider adding this product to my routine? When I first experienced drastic hair fall then I would have reached for this product on a daily basis! However, my Viviscal supplements have done the trick and I now have over 45% new hair growth all between 1-4 inches long which means my scalp is rather dense with baby hairs, so I no longer have the need for a scalp boosting serum. I will however use it as a treat if my head is feeling a bit tight or itchy. I would definitely recommend this to someone who is experiencing hair fall and a sensitive and irritated scalp. Have you tried these or another hair serum brand? Let me know your findings below.